In the previous post I explained how we understand the difference between Majorana and Dirac Fermions. Here will explain how we understand Dirac Bosons and why we consider that the Pauli exclusion principle is here aplicable too. As you now if you have read other posts from this blog, our model consists on at least two intersected (entangled) gravitational fields that vary – expand and contract – periodically, with equal frequency and equal or opposite phase. We consider that the known fundamental particles and the atomic nucleus are the 4 fields created by that gravitational intersection. For us, when (at least) two intersected gravitational fields vary with an opposite phase, the created fields are fermions. And when those two intersected gravitational fields vary with the same phase (both expand at the same time, and later they contract at the same time), the created fields are bosons. 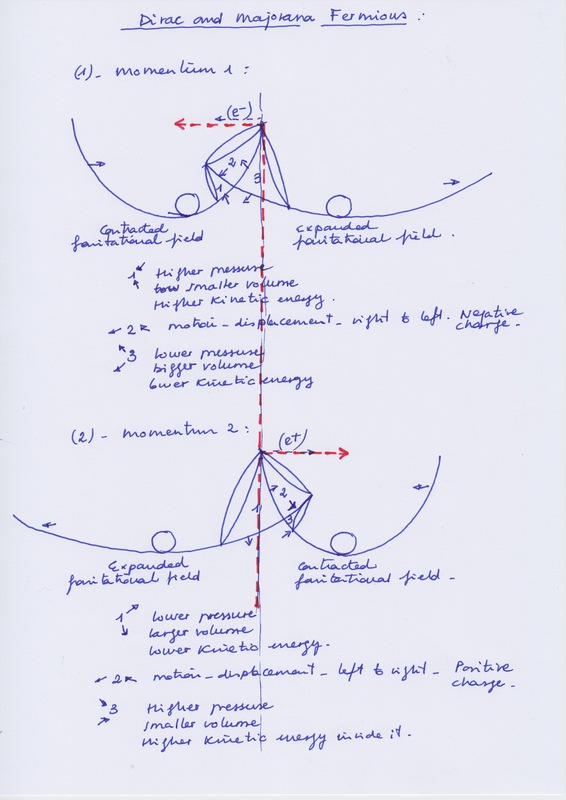 In the picture above you can distinguish two momentums: the momentum 1, when both intersected gravitational fields are contracted, and the momentum 2 when they both are expanded. There is a spatial symmetry between opposite fields in each momentum. But there is an asymmetry between momentum 1 and 2: At momentum 1 there is a displacement toward the left side, and at momentum two there is a displacement toward the right side. I have put this picture again because when it comes to bosons there is an asymmetry too, it exists a displacement toward the opposite sides. And if you compare them you can see other similitudes. The directions from the forces of pressure that has field 2 at momentum 1 in the fermion picture above and field 3 at momentum 1 in the bosons picture (the picture at the top of the post), you could see that they are identical. But they both are inverted with respect to field 1 at momentum 1 in the bosons picture. Field 2, at momentum 1 and 2, in the fermions picture has a different volume than fields 1 and 3 at momentum 1 in the bosons picture. I called field 2 at momentum 1 and 2 “electrons” and “positrons” in the fermion picture. So fields 1 and 3 at momentum 1 in the bosons picture are different fields. What do fundamental particle correspond this boson fields 1 and 3 with? for its volume they are similar to fermionic neutrinos. It changes the perspective. Now you can see that the fields created by the two intersected gravitational fields do not have left-right displacements, they have up and down movements that create the temporary asymmetries at different times. Here the asymmetries occur in the vertical plane, they are not right and left asymmetries as occur in fermions but they are up and down asymmetries. At momentum 1 field 1 and 3 are perfectly antisymmetric. They have a very similar or equal volume that we saw field 3 at momentum 1 and field 1 at momentum 2 had in the fermions picture. We called this fermionic fields 1 and 3 as neutrino and antineutrino. They was pressured-less fields. 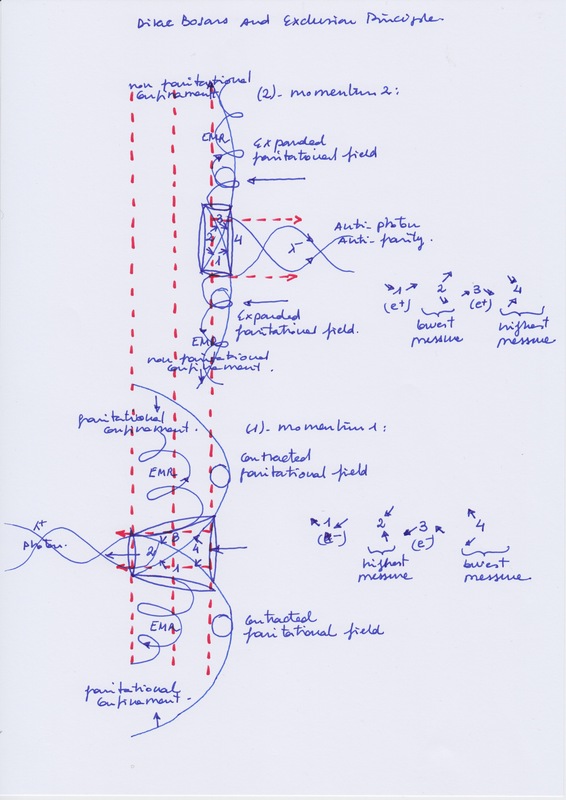 But this bosonic fields are not presured-les fields, they have the same force of pressure that we saw on fermionic electrons and positrons, but this bosonic fields create less energy than the fermionic electrons/positrons at the same time because the bosonic fields have a larger space than the fermionic electrons/positrons fields and so the kinetic velocity inside them is lower. This bosonic fields 1 and 3 have too the same inclination with respect to the plane of the two intersected gravitational fields, that we saw in fermionic neutrinos and antineutrinos. We could consider bosonic fields 1 and 3 as a neutrino and an antineutrino existing at the same time, so they are Dirac neutrinos, but they will be highly pressured neutrinos. I have said in other posts we consider that current physicists are mistaken the force of pressure that fields experience with material masses. This is because I did not said highly massive neutrinos. On the other hand, field 2 at momentum 1 in the above (bosons) picture, experience an ascendent movement that creates and ascendent force. It creates the known as photon. This field number 1 is opposite to the inverted field 4 at the same momentum 1. Field 4 here is antisymmetric and inverted with respect field 1, we could consider it as its antiparticle (its anti field), but it would not be exact, because field 4 here does not have the same pressure force that has field 1 and it does not create the same kinetic energy. I think it would be more accurate to say that field 4 has an anti energy with respect to the energy of field 1. But they are only terms for understanding what are we speaking about. A moment later, at momentum 2, fields number 1 and 3 are continues being antisymmetric. But now they do not have an down to up movement as in the momentum 1, now they have an up to down movement, an inverted kinetic direction with respect the kinetic direction they had at momentum 1. We could say that they are their own Majorana antiparticle. But because the spatial volume is smaller at momentum 2, the kinetic energy that they creates increases. The force of pressure on them is the same with respect to momentum 1 , although it is inverted, but the energy that create fields 1 and 3 at momentum 2 is higher than in momentum 1 because the kinetic velocity increases. These fields are similar spin than fermions field 1 (neutron) at momentum 1 and and field 3 (proton) at momentum 2. But as we saw, those fields had different inclination, they experienced a gravitational confinement and they had more pressure than bosons fields number 1 and 3 at momentum 2. At momentum 1 the intersected gravitational fields have an inward movement that is contrary to the direction of the radiation produced by fields number 1 and 3. We consider that the contention created by the inward gravitational force of the intersected gravitational fields – when they contract – creates the known as “confinement”. This confinement does not exist at momentum 2, when both gravitational fields expand, because they have now am outward force that follow the same direction that the “electromagnetic (EMR) radiation created by fields 1 and 3. There is too an oscillation in the orbital plane from fields 1 and 3 at momentum 1 and 2, and in the radiation that they creates. On the other hand, at momentum 2, it occurs that field 2 losses all its ascendent force of pressure. Now it moves up to down. This descendent movement is currently known as a “decay” of energy. It could be thought that its lost energy is produced now by fields 1 and 3, and this save the energy conservation principle. Fields 1 and 3 has the same force of pressure, although inverted, than at momentum 1 but they create at momentum 2 more energy. We said that this increasing energy from fields 1 and 3 at momentum 2 comes because of the increasing kinetic velocity when its spacial volume decreases, and now there is a non gravitational contention too. We think that the energy lost by the field 2, unable now for producing a photon at momentum 2, is placed now at field 4. 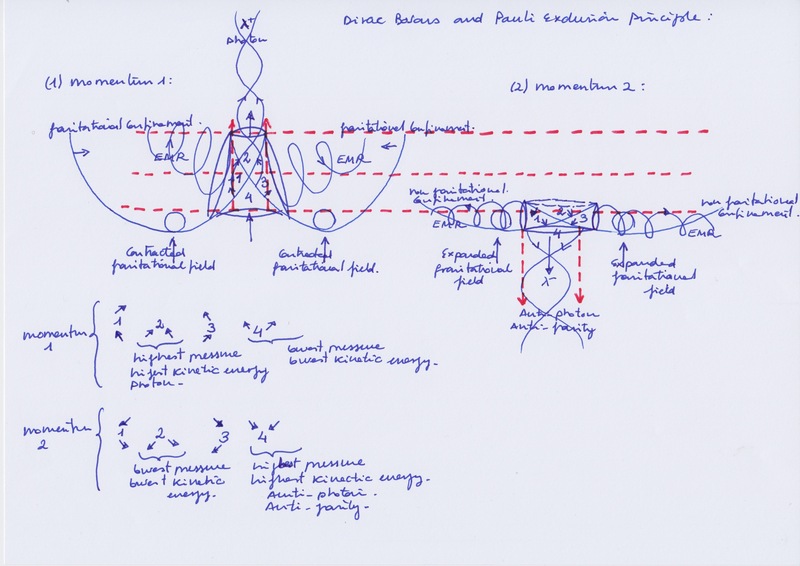 Field 4 has now an inverted force – inverted with respect to the direction of the gravitational flux – that represents an anti-gravitational force, and it creates an anti-energy that is an anti-photon. Anti-photonic energy participates then in the law of conservation of energy. For us field 4 at momentum 2 is the Dirac antiparticle from field 2 at momentum 1. When it comes to bosons, the relationship that exists between field 2 and field 4 is the same that exists between fields 1 and 3 when they are fermions. So, in the case of bosons, when field 2 has the higher pressure at momentum 1 it would be like a proton and field 4 would be like an antineutrino (without pressure, a massless neutrino); and when field 2 has the lower pressure at momentum 2, it acts like a neutrino (without pressure, a massless neutrino) and filed 4 acts like a neutron (here with a higher anti-gravitational force of pressure). I understand that it could be quite difficult to follow this explanation only reading this text, especially if you are used to working with the mathematical language. But if you want to, you can see the pictures that I have put and observe by you own all the asymmetries and movements that it appears or that are suggested and extract their consequences. So, it could be said that when it comes to bosons, the Pauli Exclusion Principle justifies the existence of anti-photonic energy and antigravitational force. Anyway, the characteristic of fermions and bosons are provisional, temporary, although periodical too. Between each gravitational expansion and contraction it occurs a delay. This is the because the opposite phases of gravitational variation (that create fermions) tend to be equal (transforming into bosons) with the pass of the time. And when the phases of variation are equal (in the case of bosons), they tend to be opposite (transforming bosons into fermions) with the pass of the time. So it could be say that all fermionic particles are transformed into bosonic particles with the pass of the time, and viceversa, in a cyclical way. Finally to say that for us the pictures that I have commented here represent a diatomic molecule, but they represent a solar system or two entangled universes too. The possibilities are infinite at macro and microcosmic levels. We think that our solar system is formed by the intersection of at least the gravitational fields of two suns, and that we are not orbiting our sun, we are orbiting around field number 1 or field number 3. And below our Earth planet it would exist another planet with its gravitational field entangled to our gravitational field. In this sense, the pictures of this post could be considered too as the entangled gravitational fields from our Earth and an Anti-Earth. In this sense our Moon would not be orbiting around our Earth Planet but around field (1 if the Earth’s gravitational field is the left gravitational curvature of the picture), or around filed 3 (if the Earth’s gravitational field is the right gravitational curvature of the picture). But these ideas will be the subject of another post.